The recently-rebranded A.C. Connecticut (formerly CFC Azul) will kick off its new era with a new head coach after they handed the reins to Shaun Bailey on Monday. 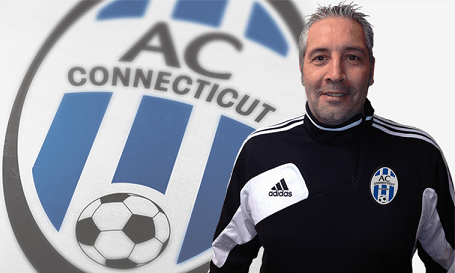 Bailey, who previously served as Director of Coaching for the Connecticut Junior Soccer Association, succeeds former head coach David Kelly. “I’m looking forward to working with some of the top amateur soccer players in the Northeast,” Bailey said in a team release. Bailey, native of Colchester, England, spent his early years playing at Colchester United FC, Harwich & Parkeston FC and Halstead Town FC. In 2000 he spent one season as the head coach at Halstead Town FC. More recently, he completed his ninth season as the assistant coach of the women’s soccer program at Western Connecticut State University despite being diagnosed with brain cancer in April. Fortunately for Bailey, he won’t have to attend to his new duties alone. Joe Mingachos, Alex Harrison and Anthony Howard will serve as assistants as Bailey embarks on his first season at the helm. “I am confident that, with the staff joining me and the resources provided by the club, we can provide a top training environment for the best players in the area,” Bailey said. The Nutmeg State selection reached the PDL Eastern Conference Semifinal as a wild card. They beat Reading United FC in the play-in game before falling to Jersey Express, who eventually claimed the Conference crown. It was the club’s first playoff berth in its three-year history. “(W)e are extremely lucky to welcome Shaun Bailey as our new Head Coach,” AC Connecticut general manager Robin Schuppert said in a statement. “Over the years, I have gotten to know him as one of the most well respected and passionate personalities in our sport. He’s an educator of the game and everyone in our club will benefit from his knowledge. Our players will learn a great amount from Shaun and his staff.